DLB977 was new to Crosville in July 1959 as a convertible open top bus. 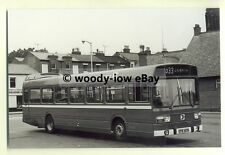 It was sold in March 1973 to Bristol Omnibus as their 8580. It was withdrawn by Bristol in June 1980 and sold in August 1981 to Youngs of Rampton. Lloyds of Bagilt Leyland PD3/4 Northern Counties Queen Mary - 963CUF ex Southdown Motor Services - low res image - your print is sharp with no light reflections!Good Condition. A 6x4 colour photograph of Western Welsh AEC Reliance 205 KKG205E taken in Neath June 1969. This is a professionally produced colour print taken from an original slide. EX GLASGOW CORPORATION. LEYLAND ATLANTEAN. BODY WORK BY ALEXANDER. NEW IN DECEMBER 1967. SHOWN HERE IN EDWARDS YARD.. THE WHITE LINE DOES NOT APPEAR ON THE PHOTOGRAPH. CLYNNOG & TREFOR MOTORS OF CAERNARFON. & EX CITY OF OXFORD. THE WHITE LINE DOES NOT APPEAR ON THE PHOTOGRAPH. It's then up to you. Persistentoffenders will be blocked without warning. A 6"x4" Black & White photo, produced from the original negative of TCY 662, see scan above. ~~~~~~ This is a real photograph produced from the original negative. ALL THE IMAGES SHOWN ARE REDUCED RESOLUTION AND ARE PARTIALLY. UNDER NO CIRCUMSTANCE ARE PRINTS OR SCANS AVAILABLE FROM. ANY REQUEST FOR THESE WILL BE IGNORED. A 6x4 colour photograph of Western Welsh Leyland Leopard 1512 TKG512J taken in Cardiff March 1971. This is a professionally produced colour print taken from my original slide. A 6x4 colour photograph of Cardiff Leyland National 204 GBO139N taken in Cardiff Feb 1987. This is a professionally produced colour print taken from my original slide. Deinolen Motors JC9795;. Crossley DD42/7 Crossley, August 1970 The actual slide is clear and in focus. It is possible that the slide may have suffered age related colour fading or scratching. The scan is a low-resolution jpeg which has been spoiled to prevent copying. A 6x4 colour photograph of Crosville Leyland National SNL980 UTU980R. This is a professionally produced colour print taken from an original slide. A 6"x4" Black & White photo, produced from the original negative of RCY 350, see scan above. ~~~~~~ This is a real photograph produced from the original negative. Crosville Bristol FLF6B Lodekka JFM239D Fleetnumber DFB239 with ECW body in original livery. 5.5 x 3.5 B/W glossy photograph. Clear picture any glare/reflections are from the photo of the photo. 35mm size colour negative of Crosville DVG577. Crosville on one side & m7 Llanrwst on the other. m7 Llanrwst. Novelty Keyring. Western National. National Welsh. East Midland. A 6x4 colour photograph of National Welsh Leyland Leopard UD369 WUH186T, Leyland National N586 NWO502R & Bristol VRT HR811 VHB675S taken in Barry Dec 1990. This is a professionally produced colour print taken from my original slide. A 6x4 colour photograph of Cardiff Bus Leyland Titan demonstrator 55 FHG592S taken in Cardiff March 1979. This is a professionally produced colour print taken from my original slide. Crosville Wales Leyland Olympian ECW - DOG185 - B185BLG - low res image - your print is sharp with no light reflections!Good Condition. The photo, by Daniel Hill Photography, is in goodpre-owned condition with minor signs of handling and very faint surface scratching. A 6"x4" Black & White photo, produced from the original negative of CUN 942, see scan above. ~~~~~~ This is a real photograph produced from the original negative. WBX2T, FBX560W, FDE916R & NTH119H; Carmarthen, 10/87. 4 x 35mm size black & white negatives of Davies various. A 6x4 colour photograph of National Welsh Leyland Leopard towbus E1086 TKG506J & Leyland Atlantean training bus TS1066 PKG372H taken in Barry Aug 1986. This is a professionally produced colour print taken from my original slide.